Can’t bring people to Dublin without giving them some free time. Today everyone was free until 4 PM when we left for Mass. People scattered all over Dublin to see what they were interested in. Some firefighters with us went to see local fire stations, others jumped on the Hop On, Hop Off Tour Buses that hit all the highlights of Dublin. Others went to tour the Guinness Brewery, churches, bookstores, art museums and more. Everyone ate at nice pubs and local restaurants. At 4:00 PM we took the bus to the oldest parish in Dublin named after St. Audeon. Then we went to a rousing evening of Irish music and dance. Very fun. Like I said a week ago, this had to be a forgery if not a heretical document written by the gnostics back on the 4th century. Catholics should be prepared for repeated reports (assaults) like this. Here is the article about the Vatican’s comments on the fake document suggesting that Jesus had a wife. 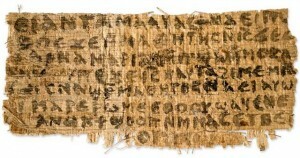 An ancient papyrus fragment which a Harvard scholar says contains the first recorded mention that Jesus may have had a wife is a fake, the Vatican said Friday. 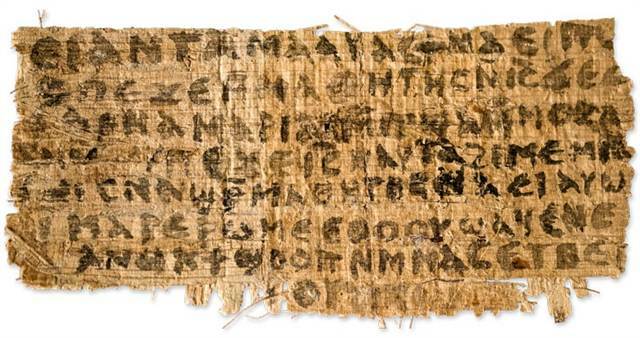 “Substantial reasons would lead one to conclude that the papyrus is indeed a clumsy forgery,” the Vatican’s newspaper, L’Osservatore Romano, said in an editorial by its editor, Gian Maria Vian. “In any case, it’s a fake. Joining a highly charged academic debate over the authenticity of the text, written in ancient Egyptian Coptic, the newspaper published a lengthy analysis by expert Alberto Camplani of Rome’s La Sapienza university, outlining doubts about the manuscript and urging extreme caution. The fragment, which reads “Jesus said to them, ‘My wife…'” was unveiled by Harvard Professor Karen King as a text from the 4th century at a congress of Coptic Studies in Rome last week. “It’s really pretty unlikely that it’s authentic,” University of Durham Professor Francis Watson told Reuters after he published a paper arguing the words on the fragment were a rearrangement of phrases from a well known Coptic text. Watson, who has previously worked on identifying forged gospels, said it was likely to be an ancient blank fragment that was written over in the 20th or 21st century by a forger seeking to make money. Watson argues that the words on the fragment do not fit grammatically into a larger text. Manuscript experts who heard King’s presentation quickly took to their blogs to express doubts, noting that the letters were clumsy, perhaps the script of someone unused to writing Coptic. Writing from the conference, early Christian scholar Christian Askeland said specialists there were divided between two-thirds who were extremely skeptical, and one-third convinced the fragment was false. “I have not met anyone who supports its authenticity,” Askeland wrote from a session of the Tenth International Congress of Coptic Studies, where King gave her paper. During the conference King stressed that the fragment did not give “any evidence that Jesus was married, or not married” but that early Christians were talking about the possibility. AnneMarie Luijendijk, associate professor of religion at Princeton University, said she concluded that the fragment was indeed an authentic, ancient text, written by a scribe in antiquity. “We can see that by the way the ink is preserved on the papyrus and also the way the papyrus has faded and also the way the papyrus has become very fragmentary, which is actually in line with a lot of other papyri we have also from the New Testament,” Luijendijk told Reuters during the conference. The idea that Jesus was married resurfaces regularly in popular culture, notably with the 2003 publication of Dan Brown’s best-seller “The Da Vinci Code,” which angered the Vatican because, among other things, it was based on the idea that Jesus was married to Mary Magdalene and had children. Christian tradition has long held that Jesus was not married and the Catholic Church, by far the largest in Christendom, says women cannot become priests because Christ chose only men as his apostles. Beautiful Family, New One Has No Idea How Lucky He is! 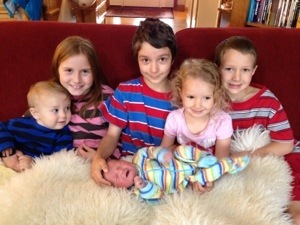 My son and his wife Anna have marvelous kids (so does my Daughter Cindy and her husband Be). But I am featuring Jesse’s here because little Joseph Charles Francis Ray was just Andes to the family. Anna is sure glad he is out :-) He was 7 lbs. 15 oz. and was warmly greeted by his older siblings. My dad Charles died two months ago so they named him after my dad. Francis is after my mom who cried with joy at the honored bestowed on her and the memory of my father. I LOVE being a dad and grandpa (papa) and I love watching these homeschooled kids growing up to be so delightful in every way.